The Mondrian residential block lies on the shores of an artificial lake that was originally created as part of a green zone dedicated to all kind of leisure time activities. The position of the new building was determined by the existing sports fields of a nearby school and the park of an adjacent hospital. The plan to increase the density of the estate resulted in the creation of a long, narrow development site. Although the architects related their building to the rectilinear logic of the existing urban structure, it seems to stand out from the local situation. This impression may have to do with the height of the ground floor, with the expressive facade or with the building s distanced approach to the nearby lake. The positive aspect of the increase in density was the in¬troduction of more flexible housing standards into the old, system-built housing estates. Mondrian should also be viewed in this context. 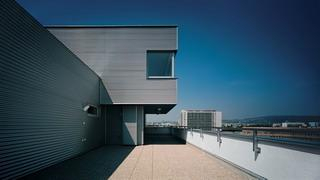 In comparison to the surrounding pre-fabricated blocks Mondrian offers far higher standards. These include: an underground car park, the materials chosen, the green zones and, finally, the size of the apartments, which range between 60 and 170 m². Typically, the apartments have an open living area and separate bedrooms, and in addition, the west-facing flats have a wonderful view across the city centre and of the foothills of the Carpathian Mountains. 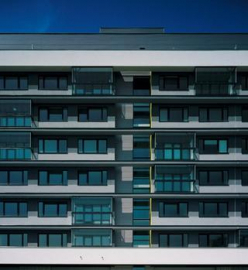 The standard floors have one-, two- and three-room apartments, while there are three- and four -room maisonettes with roof terraces on the top level of this superstructure. The complex spaces offer exciting places to live. The winter gardens on the east facade in a way recall the measures employed by residents of pre-fabricated blocks to enlarge the floor area of their apartments. 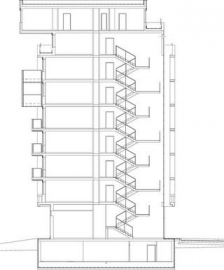 But on the other hand this measure is an intelligent response by the architects to the regrettable fact that most residents tend to glaze in their balconies anyhow. 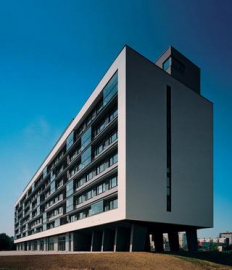 In contrast to the standard pre-fabricated blocks, which served just one function, namely living, on the ground floor of this building there is a service zone directly beside the apartments. Even the name Mondrian alone could be interpreted as indicating a sense of solidarity with Dutch Modernism. 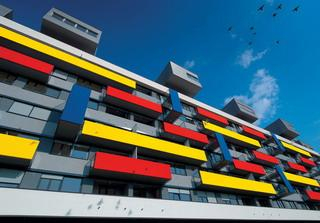 Painted geometric compositions in primary colours recalling the paintings of Piet Mondrian are to be found in the facades of the building. 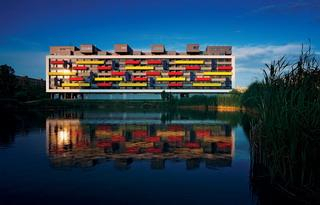 The main facade with its white frames looks exactly like a Mondrian composition in red, yellow and blue. However the expressive form of the building also contains references to a number of well-known examples of modern architecture. 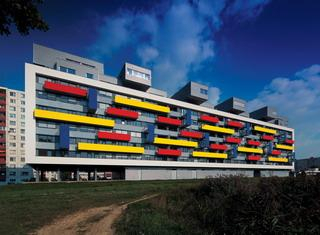 Even though the appearance of Mondrian gives us reason to reflect on the concept of increasing density and the am¬bivalent approach to the concept of modernism in Slovakia (admiration for the formal architectural elements coupled with rejection of modernist urban ideas), we must agree with local residents that it is better to have a rather striking small brother than to be bored on one s own.